Annie grew up riding Welsh ponies and Morgan horses at breed and open shows. In her teens she competed her Morgan horse in competitive trail riding and endurance, up to 100 miles(160km). At this time she also galloped Quarter Horses and Thoroughbreds on the farm and started many horses and ponies for both riding and driving careers. After obtaining her BA., Hons in Communications from Queens University she was keen to explore the racing world further, so she traveled to New Zealand to gallop Thoroughbreds for top trainers Sheila Laxon and Greame Rogerson. On returning to Canada she began eventing – where she trained her TB/Cob cross to Preliminary level. Annie now rides under the tutelage of Garry Roque of Caledon, ON. In addition she has cliniced with Leslie Law, Jimmy Wofford, Lucinda Green and Jane Savoie and continually audits top quality clinics to upgrade her skills. 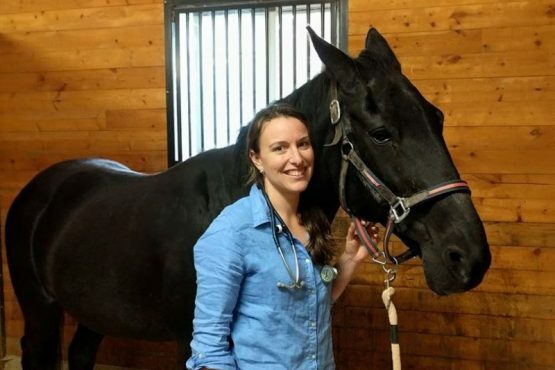 In 2014, Annie obtained her EAGALA certification and she is currently working towards the advanced designation as well as participating in a mentorship program while running the Equine Assisted Psychotherapy (EAP) and Equine Assisted Learning (EAL) sessions at Rivermore. Annie enjoys breeding quality, amateur type sport horses. Her first home-bred, Lux R (Checkmate x The Hony), was the winner of the weanling Canadian Sport Horse class at the Royal Winter Fair in 2013 and will begin competing under saddle in 2017. Lise grew up showing in the hunter ring as a child but always schooling primarily with eventing and dressage riders including Garry Roque, Stephanie St. Pierre and Elaine Ward. Most recently she has trained with top hunter/jumper coach Jen Sweet. Lise has ridden in clinics with Erynn Ballard, Hyde Moffat, Hugh Graham and Margie Gayford. After high school, Lise studied at D’Arcy Lane and then spent two years as a practicing REMT (Registered Equine Massage Therapist). The extensive anatomy and physiology knowledge gained through this experience forever changed how she would view riding and managing horses. Lise then spent three years managing a top Hunter/Jumper show barn for A-circuit trainer Nancy Wetmore. Her work included starting young horses and schooling and conditioning show jumpers. During this time she learned what it takes to keep a show horse in peak condition and achieving its best. Looking to return to the show ring, Lise then brought along her young off-track Thoroughbred, Top Gun, to success in the Trillium Hack division (Champion at Trillium Championships in 2007) and the 3′ Low Hunters (Central West Zone Champion 2011). Lise also started and brought along the young warmblood Poetic, who she rode to 9th place in the Lieutenant Govenor’s Cup at the Royal Winter Fair in 2012. Lise has a strong belief in setting a good foundation with correct basic skills and that installing all the tools in both the horse and riders “tool box” make advancements logical and simple. Bring your own vet and farrier, or use our team of trusted professionals! Rivermore stable is proud to offer Buckeye Feeds from Davis Feed & Farm Supply.